You may have seen a Swiss Army® Knife, which is a compact, foldable gadget that includes a variety of tools such as knives, screwdrivers and scissors. Likewise, Bigshot's polyoptic wheel includes several optical modules that allow you to explore different creative dimensions as a photographer. 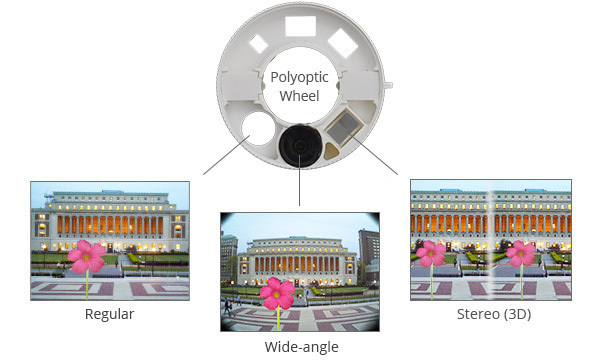 The optical modules on the wheel work with the primary lens on Bigshot's printed circuit board (PCB) to capture three types of photos − regular, wide-angle (panoramic) and stereo (3D). As seen in Figure 1, the wide-angle photo appears distorted and the stereo photo has two views within the same image. These photos are automatically processed after they are downloaded from the camera to generate the final panoramic and 3D photos. In this section, we take a closer look at how the lens wheel works.